President Toro answers a question from Erin Sagnelli, a senior theater major. Central Connecticut State University student Jessica MacLean was shocked to learn this week that the theater professor she considered a trusted mentor had been accused of sexual misconduct and is likely to be dismissed. MacLean, who had been looking forward to her advanced acting class with Professor Thomas Delventhal, who was also her adviser, said she had never known him to behave inappropriately with students. Elliott Skidmore, a sophomore who expects to major in theater, agreed. 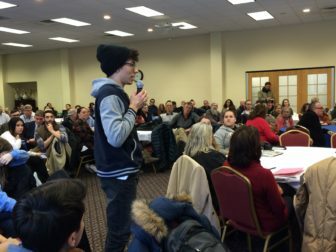 MacLean and Skidmore were among the close to 200 students, faculty and staff who attended a university forum late Wednesday afternoon at which President Zulma Toro discussed the investigative report released early this week detailing the alleged sexual misconduct of Delventhal and another theater faculty member, Joshua Perlstein. The report concluded that it was “more likely than not” that each had engaged in sexual misconduct with one or more students. A day after the report was released, the university president attempted to reassure students and answer their questions. “It was not easy for me to read those reports, but I have to tell you I am convinced now more than ever that we are going to emerge from this situation stronger than ever,” Toro said. Toro has taken steps to dismiss both faculty members. Perlstein was the subject of an article in the university’s student newspaper, The Recorder, last April that reported accusations of sexual misconduct from his former students. Toro placed Perlstein on paid administrative leave at that time and hired the Hartford law firm, Shipman & Goodwin, to conduct an investigation. The nine-month investigation, which entailed reviewing thousands of documents, including emails and texts, and interviews with dozens of faculty, staff, and current and former students, supported many of the claims of sexual misconduct that were included in The Recorder article. It also uncovered additional complaints, including some against Delventhal. Toro placed Delventhal on paid administrative leave last week, just before the spring semester started. Both faculty members, who have been at CCSU since the 1990s, will continue to draw their salaries, which are in the $100,000 range. Toro said this week it may take as long as a year to fire the men because of steps required under collective bargaining. She also announced plans to appoint new leadership of the university’s Office of Diversity & Equity and to reorganize the human resources department. At the forum, Toro talked about her plans to adopt an institution-wide reporting, monitoring and tracking system to collect and disseminate information and data, as well as her plans to explore a new model for investigating sexual misconduct on campus. She said she intends to meet with students and faculty to get feedback as those plans develop. 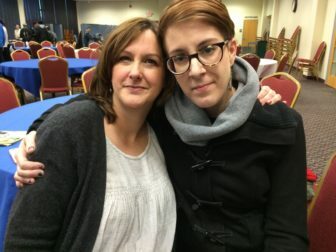 Kileen Nadeau, left, and Anna Kelly say they were the victims of unwanted advances from CCSU Professor Joshua Perlstein. Two of the women who said they were victims of Perlstein’s unwanted advances and whose allegations are included in the investigative report attended Wednesday’s forum and spoke after the event. The release of the report, however, has given her more confidence that the university will make needed changes. In the report, Perlstein conceded that he had kissed and hugged Kelly but said he did not grab her buttocks. But, Kelly added, “yesterday and today have just been crushing” as she read the report and realized the full scope of the misconduct and the administration’s failure to respond adequately to complaints. Erin Sagnelli, a senior theater major at CCSU, had several questions for Toro. Erin Sagnelli, a senior theater major, asked Toro what she would do to publicly support the theater department. Toro said the university will send out press releases about the achievements of faculty members and students in the department and will purchase large advertisements for each production. In addition, she said the university is pursuing a partnership with Hartford Stage. Toro also said that she is going to be hiring two-tenure track faculty members and will ensure that students are offered all the classes they need and that productions continue as scheduled. “The show must go on,” she said. Several students said they are concerned that the report appeared to be critical of certain aspects of the theater department’s operation which they see as positives. The report spoke of an “informal” atmosphere in the theater department where students called faculty members by their first names and said some faculty frequently socialized at parties or other gatherings with students where alcohol was consumed. Delventhal required students to keep personal journals, the report said, which they shared with him, and made them participate in massage circles — two practices that some of those interviewed told the investigators made them uncomfortable. The investigators said that witnesses consistently reported that Delventhal shared many details or stories of his personal life, sometimes crying in class, which also made some students feel uncomfortable. “It appears as though the informality of the department has led to a climate in which personal space and boundaries are not respected,” the report said. “Those are things that, if you’re not a theater person, you’re not going to understand,” Franco said, but she said such practices help the students bond with professors and each other. Franco, who fled Puerto Rico last year after Hurricane Maria, said Delventhal “was the person who showed me everything” when she arrived at CCSU in November, 2018. Elliott Skidmore, a sophomore, asks a question at the forum. Skidmore told Toro that while he found much of the report’s findings “completely appalling,” he was confused by the questions raised about the journals and the “openness” of the classes. “For me as a theater student, those are things I come to expect,” Skidmore said. He said that the theater instruction teaches students how to be open with people — a skill that is particularly helpful during auditions with people who are strangers. 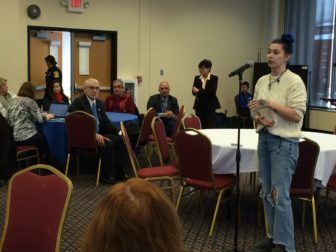 Relatively few students and faculty members spoke up during the forum, but a cluster of theater students lingered after the forum. The students said they weren’t shocked by the allegations against Perlstein because of last year’s Recorder article and because several said they had thought of him as “creepy” — as the investigative report also said — and had been warned by older students never to be alone with him. But some did say they were surprised at the manipulative and threatening emails that Perlstein allegedly wrote to a student with whom he allegedly had a long sexual relationship, according to the report. However, the students were shocked to learn of the allegations against Delventhal and his own admission that he had kissed at least five students on the neck and/or forehead over the years. The report also said that Delventhal was untruthful during his investigatory interview, and denied attempting to engage in any relationship with current or former students. Sagnelli said she is “angry on a very personal level” about the alleged sexual misconduct of the faculty members. 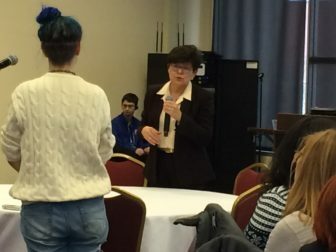 The students said they are encouraged by Toro’s steps to dismiss the professors and her other plans to improve the administrative response to sexual misconduct complaints.